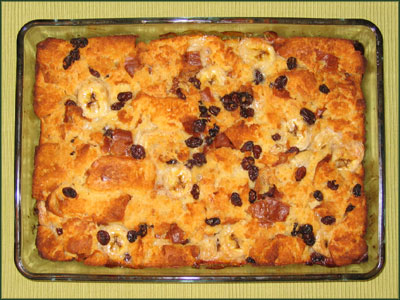 A very delicious egyption bread pudding. Spread puff pastry dough on a greased baking tray.Bake for 15 minutes until puffed and golden. Set aside. Don't put off oven. Heat milk, cream, sugar and vanilla essence in a saucepan until small bubbles from around the edge of the pan. Turn off heat and set aside. Raise oven heat to 238C. Grease a baking dish, break apart the pastry and scatter on the baking dish. Scatter dry fruits over the pastry and pour milk/cream mixture over it. Bake for 15 minutes, or until golden on top. Lightly toast almonds and sprinkle over top before serving.